Believe it or not there comes a point in the evening when it's too late for a cocktail. And sadly I have arrived home every night this week long past that point. I'm more of a 5:00, let's toast to the end of this day kind of girl. Not a 9:00, let's get this party started kind of girl. Those days are long gone. If we were still in the middle of winter (it certainly feels like that out on the sports fields) I'd be happy to snuggle up in my pjs with a Stormy Scot after the boys are in bed. But I like to believe warmer weather is on its way so I've asked Mr. C&G to come up with an after dinner (after game, after practice, etc) cocktail with my seasonal favorite Aperol. The Italian Nightcap is the perfect drink to end the evening with. 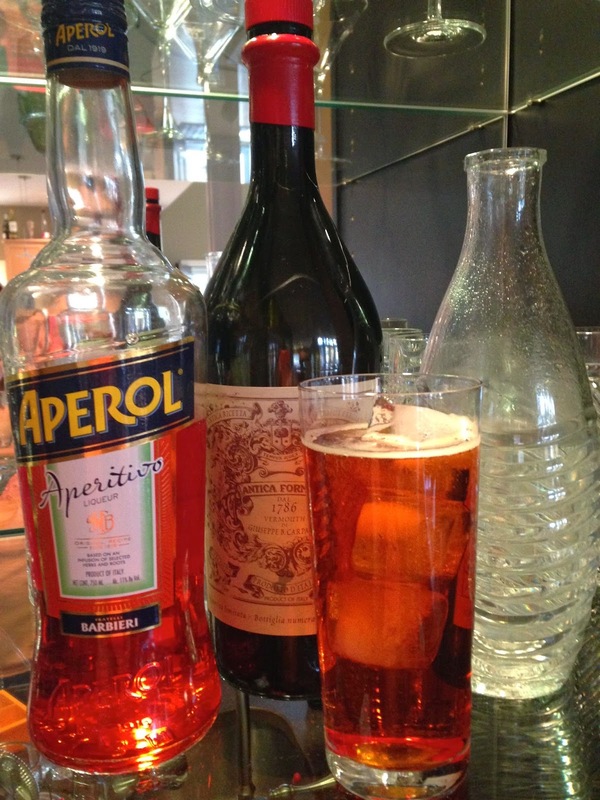 Aperol has a slightly bitter orange flavor and the Antica Formula Carpano (red vermouth) adds a rich warmth and depth of flavor without being too strong. They're both low in alcohol (Aperol, 11%, vermouth 16.5%) which is what you want so close to bedtime. Because when your days are an endless loop of school, sports, and meals eaten in the car you don't want to be doing it with little sleep or a hangover. Cheers!